If you are looking for my Just Us Girls post, please click here. Happy Saturday everyone! I'm here with a sneak peek from My Time Made Easy. Lauren has created some fantastic templates once again, and I have a fabulous one to share today. It's called Carry It and we have some terrific stamp sets from Lauren and Catherine Doucette for the holidays that you won't want to miss out on! Here's my take on Carry It. What you are looking at is a gingerbread house on steroids! LOL!!! 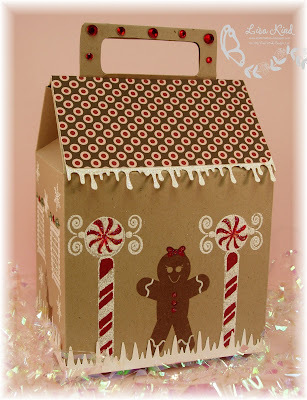 I googled gingerbread houses and found that most of them are loaded with candy canes, lattice pretzels, gum drops, and icing! So that's what I did using every new stamp set being released this month and then some! 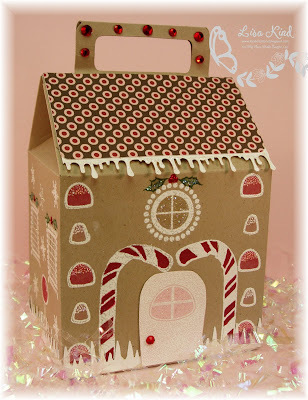 One of the gingerbread houses I saw had candy canes framing the door, and I tried to mimic that here. The only thing is that this image is really a peppermint stick. I just bent the stamp on my block to create a sort of candy cane. The door is from the previously released Home Improvement stamp set. All the images on this side were stamped in Ranger Snow Cap pigment ink, then embossed with white embossing powder. I love the windows in this set called Sugar & Spice. There is a beautiful matching door that was too large to used with my candy canes. I love the lollipop and those delicate snowflakes. The windows were just begging to be decorated with holly and berries. Is this a cute gingerbread girl or what? In The Gingersnaps stamp set, there is also a man and a boy. I love the peppermint candies too! 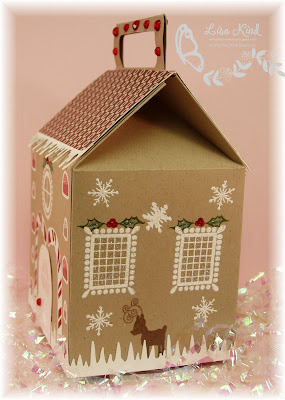 This is the smaller of the two deer in the Dashing Through the Snow stamp set. I've added tons of stickles to EVERYTHING on this template! I just love all the sparkle! The snow/icing on the bottom is a Martha Stewart icicle border punch. The icing hanging from the roof is also a Martha Stewart border punch (I can't remember the name). The roof is from the Cherry on Top digital paper from MTME also. You can see more of this template on our DT blogs by stopping by some of our MTME DT blogs. You can also get lots of inspiration in the My Time Made Easy Gallery. Thanks for stopping by today! I'll be back on Monday (release day) with a MTME group post from the MTME DT! See you then! Hi everyone! I'm here with my first post of the day. 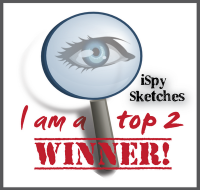 I have another one here for the My Time Made Easy sneak peek, so make sure you stop there too! 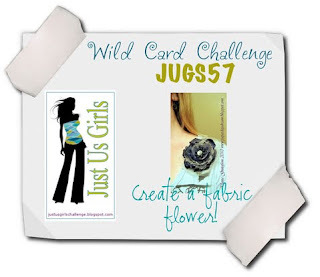 Today at Just Us Girls, Dana wants us to create a fabric flower. She introduced us to a fabulous technique that truly is a cool technique! Dana loves her fabric flowers and this Burnt Edge Flower technique was right up her alley! So here's what it looks like. Isn't it fabulous and so real-looking? Here's the link to the technique, but I'll tell you how I did it. You need a silky synthetic material cut into various size circles, cut about five slits in each circle, then hold each petal to a flame (be careful not to burn the house down!) and watch it burn and curl into these cool petals! Easy peasy! I wish I would have used more than four circles so it was fuller, but am I absolutely happy with the outcome! I stitched them together, then added this paper rose. 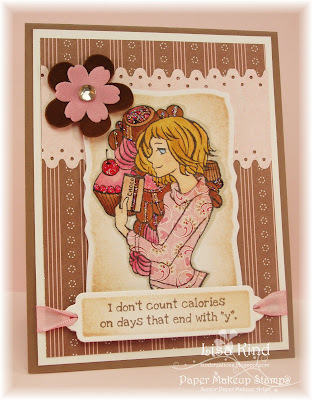 The sentiment is from the Birthday Cheer set from Paper Makeup Stamps. The leaves are a cuttlebug die that I thought looked like rose leaves. I scored them with the Scor-Buddy and sponged some ink around them. 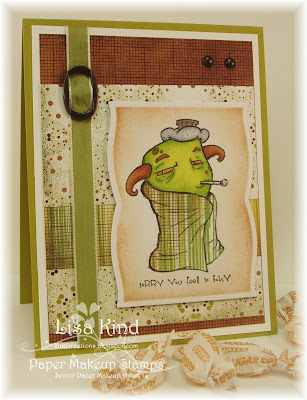 I actually made this card for our JUGs DT friend, Kristin. Her birthday is Tuesday, so please stop by her blog and leave some birthday wishes! Happy Birthday, Kristin! Stop by the JUGs blog and see all the other variations of this technique the girls have created! They are all so pretty! Thanks for stopping by today! Have a great weekend! Hi all! This week's Makeup for the Weekend challenge over at Paper Makeup Stamps is DON'T BE SQUARE! Well, I don't want Shaela (our hostess) to think I'm square, so I made two round cards! I've never done this (a shocker for me, I know! ), so I thought I'd give it the old college try! I have two nephews, Ethan and Kristoff (ages 6 and 3 respectively), and I thought these would be cute to send to them from Aunt Lisa. What kid doesn't like to get mail? I used the remnants from the PMS October Kit (I heard that as of this morning there was only one kit left) and some images from last year for these cards. 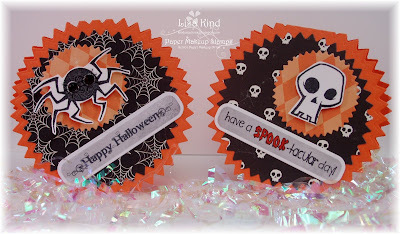 The paper on both cards is from the kit as is the Happy Halloween sentiment. The other sentiment is from the Spooky Sentiments set (a set of four sentiments for only $2.60 for bare rubber and $3.90 mounted on EZ-Mount on sale). The spider and skull are from the Spooky Solids set. There is a pumpkin and bat in this set also. Two very simple cards for two adorable boys! I'm sending them out tomorrow (each one sent separately, of course! ), so I can't wait to hear from my niece what they say! I hope your Halloween plans are coming along. What will you be for Halloween? I'd love to know! Thanks for stopping in today...I look forward to hearing your comments! Happy Saturday! We have another challenge for all of you from Just Us Girls. This week is a template challenge and we are being sponsored once again by My Time Made Easy. The JUGs design team is showing off the In Suspense template. I was going to my friend's house last night for a girls' night out, and I decided to make this as a hostess gift. I printed out the Chocolate Pumpkin paper from the Chocolate Halloween digital paper to use for the front of the template and chocolate chip for the back part. 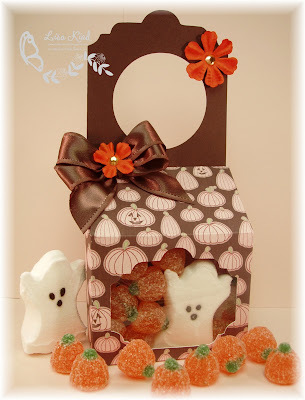 I added some acetate behind the opening and added the jelly pumpkins. I thought it would be cute to put the ghost peep in the window! The double bow was made with the Bow Easy (love that little tool!)! I just added a couple of flowers and bling for the centers. I had some scraps of the Chocolate Pumpkin digital paper left over from the template, so I used a piece to make a 3 x 3 notecard. I used the Spooky Surprise stamp set for the sentiments. I punched two tags and added it to the card with a crystal. We'd love for you to join our challenge. There's a free template at My Time Made Easy that you can download and use or use one of your choice. Can't wait to see what you create! 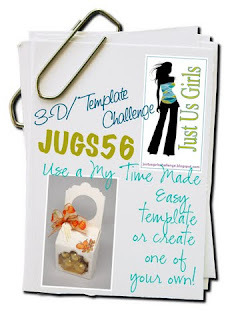 Stop by the JUGs blog to see the fantastic creations from the DT and our Guest Designer, Selma. A Monster of an Invitation! Our friends' daughter, Roxanne, called me the other day to ask me to make birthday invitations for her kindergarten son. She is taking the boys from his class to the Science Museum for a Mad Science birthday party. Sounds like a fun time for the boys! 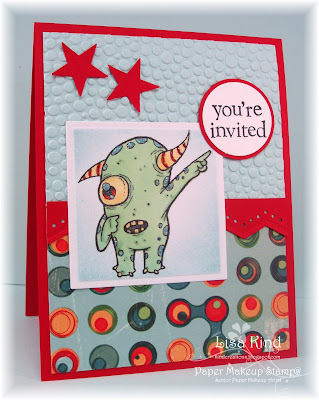 I tried to find something "mad science" related and settled on this monster image, Dreck, from Paper Makeup Stamps. I used this paper from Cosmo Cricket as my starting point. 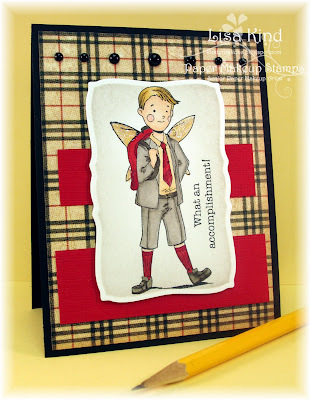 I think it's great for boy cards...I've used it several times for that and I still have a bunch of it! I colored Dreck with copics, swirled some Baja Breeze ink around the image while it was still in the die, and added some stickles for some sparkle. 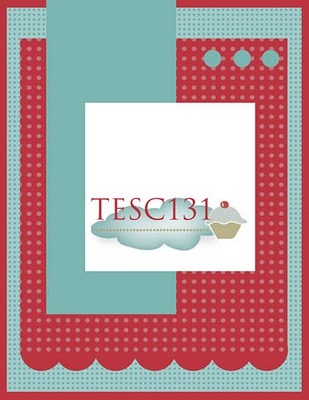 The Soft Sky piece was run through a Cuttlebug folder and I used a Martha Stewart border punch for the red piece. The sentiment is from a Stampin' Up set (can't remember which one) and the stars were a last minute addition because that corner looked so bare. Roxanne loved them and I enjoyed making them for her son! Thanks for stopping in today! Hi everyone! I see lots of you are Halloween crafting, and I wanted to keep up with you! 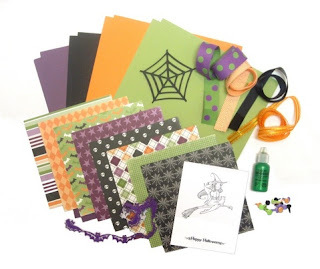 Paper Makeup Stamps has a fabby Halloween kit that will have you making a bunch of those cards you need to make and send off to your favorite ghoul! Here's what's in the October kit. I had a hard time deciding what to use on my card, there's so much to choose from! I decided to use the glittery brads since I don't seem to use them often anymore. They are so pretty! Here's what I did. Witches should be green, right? She's colored with copic markers and then I made the background look ominous with a scalloped circle and basic gray ink. I kind of got a little heavy handed in the one spot! A storm is brewing in that area! I used Mercy's Tuesday Sketch for the layout. 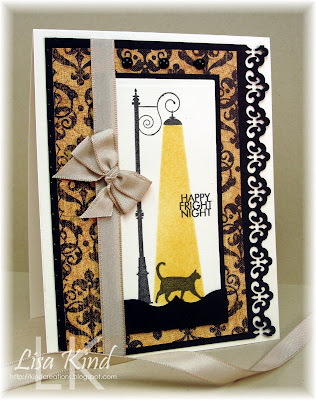 If you stop by the PMS blog, you'll also see cards using this kit by Katie and Tangii. You'll get some great inspiration there! Thanks for stopping in today! See you in blogland! Happy Saturday! It's time for another challenge from Just Us Girls! 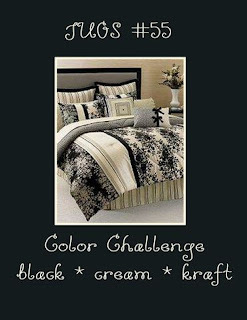 Today Alicia has challenged us with a really great color challenge....black, cream, and kraft. Whenever I see colors like these, my thoughts always turn to Graphic 45 paper. This paper plus a Mojo sketch turns to this. Now I cannot take credit for the light shining on the cat idea. 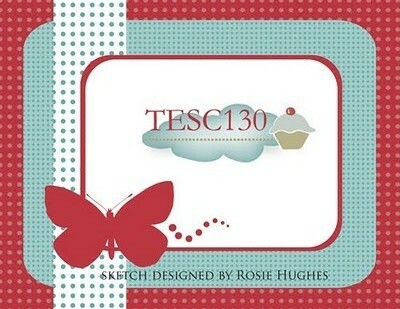 This was done on a card I saw at my LSS using this stamp (which is why I purchased it! ), and I fell in love with the idea. I stamped the image on vintage cream cardstock, then masked off the area for the light and inked it up in wild honey distress ink. Easy peasy! I added a black mat punched with a border punch, the dp, and some kraft taffeta ribbon. I used the Mojo Monday sketch from this week (flipped on its side), which is why I added that black piece on the bottom punched with a Martha Stewart punch. I don't know that I like it much, but it was the only way I could figure out how to get that element in there. The sentiment is from Spooky Treats by PTI. The double bow was created with the bow easy. I love that thing now that I know how to use it! Want some more inspiration for these colors? Stop by the JUGs blog and see what they have created. We'd love to have you play along! Thanks for stopping in today! Enjoy your weekend! 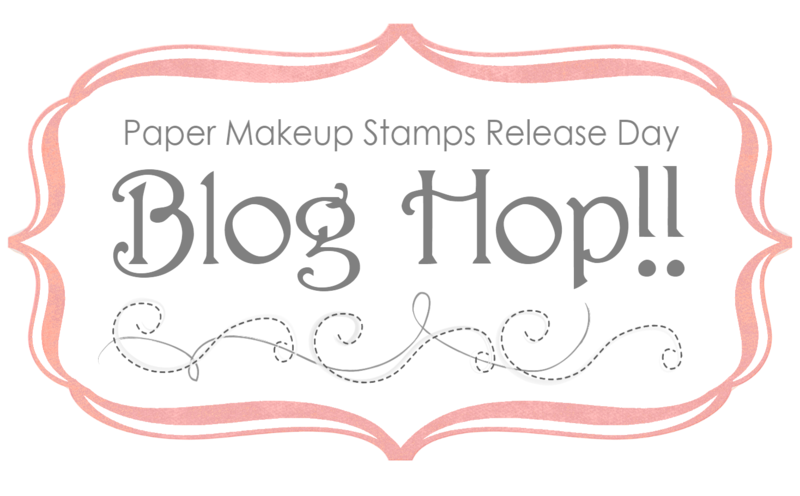 It's review day at Paper Makeup Stamps! We just had our October release on Thursday, and now we are showing it all off once again for you to get more creative juices flowing! 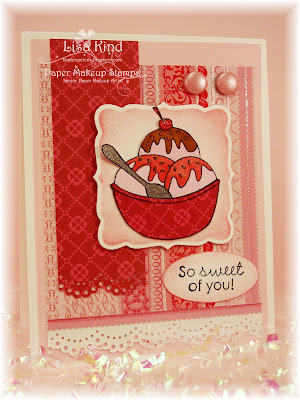 I made a card with the So Sweet set illustrated by our own Shaela Odd. I went all out in super sweet pink! I used dp from DCWV called The Sweet Stack. It's already glittered up (which I love)! I've been in a paper piecing mood lately, so I decided to piece the bowl in the coordinating dp I used on my card. I stamped and colored the image with copics on X-press paper, then cut it out. I cut, embossed, and swirled some Worn Lipstick distress ink around the cardstock while still in the die. Then I adhered the image to that piece. I added some sparkle with glitter pens on the spoon and jimmies. The bottom was punched with a Martha Stewart punch and I added the brads (from the Arelia's World of Make Believe kit). The layout is from Taylored Expressions. Hi everyone! I'm back with another Just Us Girls challenge. This week is a technique challenge, and I've chosen to challenge everyone to use acetate on their cards. You could make a clear card, use it as an accent, or use one of the techniques in the Resources section of Splitcoast Stampers that use acetate. I've chosen to make a clear card for mine. I used a piece of acetate as the base of my card. It's just the stuff you can put through your printer to make a transparency. 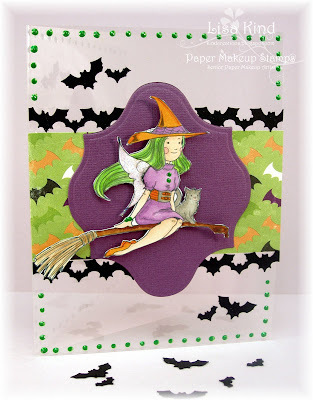 The image, purple cardstock, and dp are from Paper Makeup Stamps October Kit. I punched out a string of bats (the kit comes with ribbon that are purple bats, but it's white on the other side, and you would see that on the inside of the card, so I punched them in black instead) and lined them up on either side of the dp. The kit also comes with green liquid pearls. I decided to use it to make a border around the perimeter of the card to define it more. I also added star dust stickles to the wings. Here's a picture of what's included in the kit. 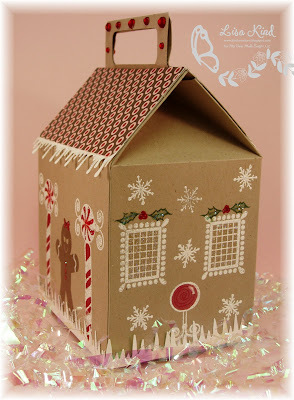 You can see more examples of this kit on the PMS blog. 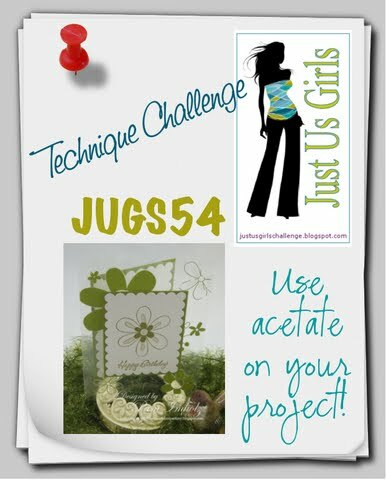 The JUGs team has some great uses of acetate, too! So please stop by the JUGs blog to see what they've done! Thanks for stopping by today. I hope you enjoy your Columbus Day weekend! 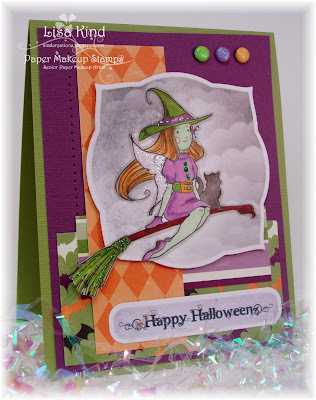 Stop by tomorrow when I'll have a review card for the October Paper Makeup Stamps new release. 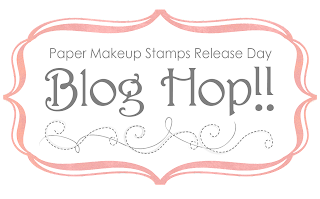 Today is finally here....release day for the October Paper Makeup Stamps! If you've been following along this week, you would have seen all the great new images and sentiments being peeked. You should have arrived here from Tangii's blog and saw her fabulous new Moody for Computers girl. If not, start at the PMS blog and then hop along getting the letters you need for your phrase. This phrase will get you 15% off the entire release. I'm showing off the hilarious Flubu monster! I just crack up whenever I see him! I saw Katie colored him green the other day, and I thought that was the perfect color for the way he was feeling. I didn't feel like coloring large spaces again (like my card yesterday), so I paper pieced again! Love that technique! And using the Xyron machine makes piecing it super easy! I used Basic Grey's Origins paper for this SCS sketch. I added SU's ribbon and hodgepodge hardward for accents. I also put crystal effects on the thermometer. Gosh, he's so pathetic looking, isn't he? This great sentiment (love the font!) comes with Flubu, too! Now I'm going to send you to Maria's blog. She always has great cards to share! She'll be jealous that I have the Flubu monster today (she loves the PMS monsters)! Before you go, please take the letter "I" with you. Don't forget to join us tonight for the Release Party. We start at 9:00 pm EST in the PMS forum, so please join us! Thanks for stopping in today! Happy hopping! Hi everyone! Today is another sneak peek day for Paper Makeup Stamps. Have you been enjoying the sneaks so far? If you haven't seen them, stop by the PMS blog to check them out. Today we are sneaking everything chocolate and diet related! Should those two words be in the same sentence? I have a new Moody girl which we are calling Moody for Chocolate. These Moody girls are so crazy to color! You can really use your imagination when coloring them! I couldn't make out what some of the things were that she is holding, but it didn't matter because I am the artist coloring it, right? No need to be intimidated! So I just colored in two shades of brown and two shades of pink. (I guess I'm in a pink and brown mood...my post yesterday used these colors, and I think I'm going to wear pink and brown to work today!) The sentiment is also new this month from a set called Weighing In. What an appropriately named set! I thought it would be fun to paper piece her sweater (I love paper piecing!) in a pattern, so I used a piece from Bittersweet by Basic Grey. I used the Taylored Expressions sketch for this card. I just added the tag on the bottom for my really cute sentiment and flipped it. Stop by the PMS blog and see more of our chocolate and diet themed sneaks. Katie has linked them to the DT blogs. Don't forget that tomorrow is our blog hop and release day. We'll be hopping all day starting at 7:00 am EST and partying in the evening at 9:00 pm EST in the PMS forum. We'd love for you to stop by. My Time Made Easy - Pinch Me! Pinch Me! 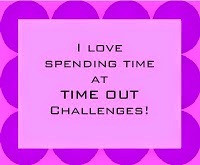 is what I said when I was asked to be on the My Time Made Easy design team! But that's not why I put that in my title. Pinch Me! 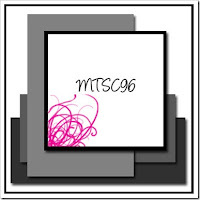 is the name of another new template being released this month by Lauren Meader. The is the last of FIVE templates released this month! It's a cute little bag that can be presented in two different ways. I believe Lauren created hers to look like a pumpkin. I "pinched in" the sides and created a bag that reminded me of a bag that you would put ground coffee in. Here's what I did. When my husband and I went to Costa Rica, we were trying to find souvenirs to bring home. Someone at the hotel suggested Costa Rican coffee from a little coffee shop around the corner from the hotel. We just laughed because we don't drink coffee, but our parents do, and it never even occured to us to buy some coffee for them from a place that grows the coffee beans and is noted for their coffee! It was a "duh" moment, for sure! Anyway, the bag of coffee they gave to us reminded me of this Pinch Me! template, so I printed out this digital paper from the Coffee Beans collection and used it for the template. I love the chocolate paired with the pink. 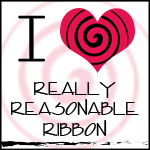 The ribbon was a happy find in my ribbon drawer because it was the perfect width for the little notches in the side of the template. 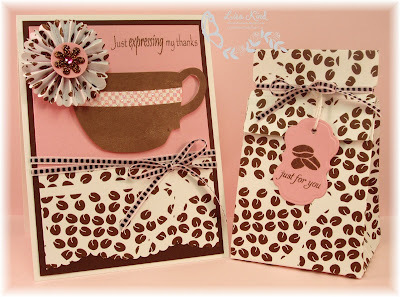 I added the "just for you" sentiment from the previously released Well Preserved stamp set and the coffee beans from the Fancy A Cuppa? stamp set to create a tag cut from a Spellbinder die. 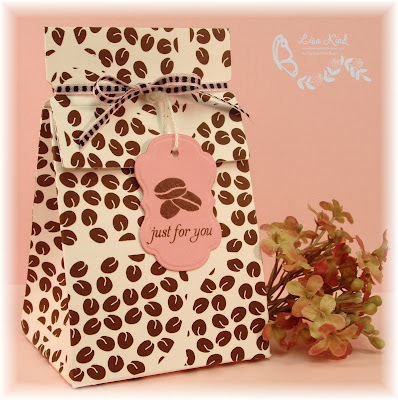 What I intended to put inside the bag were chocolate covered coffee beans, but I didn't get to the store, so just pretend you see them in there! For the card, I used this week's Mojo Monday sketch, but flipped the flower to the other side. I stamped the cup from Fancy a Cuppa? onto white cardstock in Memento Espresso (how appropriate) ink and the checkered design (from the same set) in Pretty in Pink . I added star dust stickles to the pink checks. 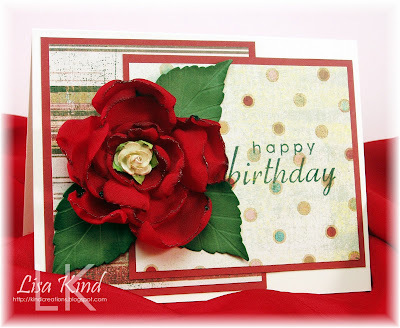 The flower was created using a new die from Tim Holtz called Paper Rosette. It's so cool! 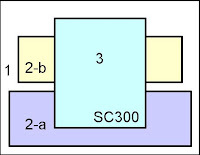 No more scoring the paper because it's all done for you with the die. I used the Coffee Beans digital paper for the flower as well. I added a blinged up flower, some ribbon, and the sentiment from Grab a Cup sentiment set and was good to go! It's hard to see on the coffee bean digital paper when it's cut up, but the beans create the shape of the cup! Pretty nifty design! The entire design team is showing off this template and some other cards using the new stamp sets, so make sure you stop by to see what they've created! You can either check out my sidebar or go to Lauren's blog where she'll have all the links. I hope you enjoyed our release this month! I've had such a fun time with all the templates! They have super easy and fast to create....something we all love! Thanks for stopping in today! I'll be back tomorrow with a sneak for Paper Makeup Stamps new October release! Hope to see you then! I can't believe that we are sneaking another release from Paper Makeup Stamps again! Where has the time gone? We went from summer to fall in 0 to 60! Today we are sneaking the new fairies we are calling the School Fairies. I have the boy to peek today...he's just so handsome! He reminds me of an English schoolboy...think of Prince William and Prince Harry. I colored him to match this dp I just purchased this weekend. It's the Communique Collection from Graphic 45. I wanted an old-school or formal look to this card, and this paper was perfect. It also sort of reminds me of a Burberry pattern. 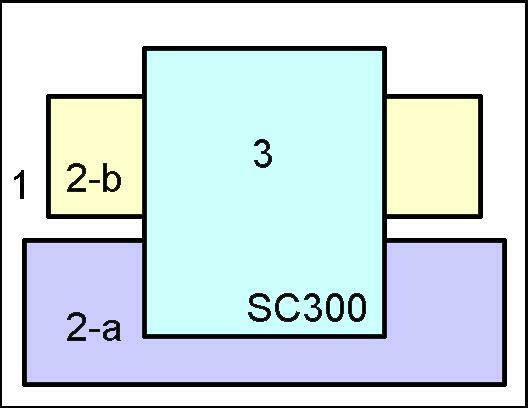 The layout is from this week's SCS sketch. The red pieces were run through Canvas Impression plate from PTI and I just added the black pearls. The sentiment is also a new one this month. The PMS DT has some other sneaks for you to see, so stop by the PMS blog to link up to their blogs. 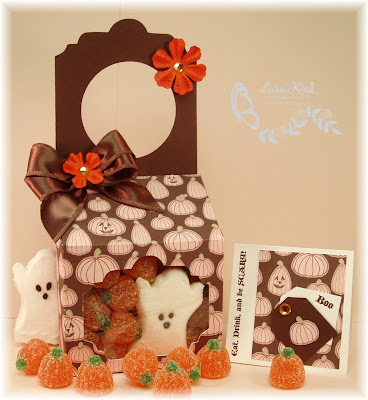 We also have a fun new Halloween Kit for purchase now. You can see examples of that one here, and you can purchase it here. This release will be available for purchase on Thursday, October 7. We're having a fun release party that evening starting at 9:00 pm EST. You can get all the information on the Release Party button on the top right of my sidebar. I'll be back Wednesday with another PMS sneak, and tomorrow with the group post for My Time Made Easy. Let me know what you think of our school boy fairy here and I'll see you tomorrow! Happy Sunday everyone! 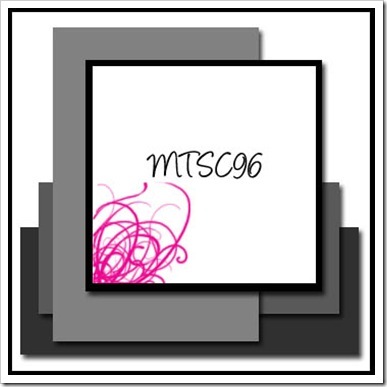 I have another new template to share with you from My Time Made Easy's October release. It's called Grab A Cup. I'm giving this to one of the secretaries at work because she introduced me to these berry flavored candy corn. They were on her desk and I tried one...yum-o!! 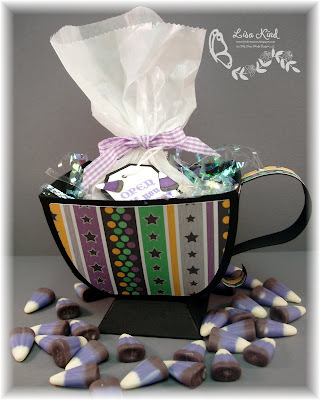 So I thought this Halloween cup would look nice on her desk with these candy corn in it. 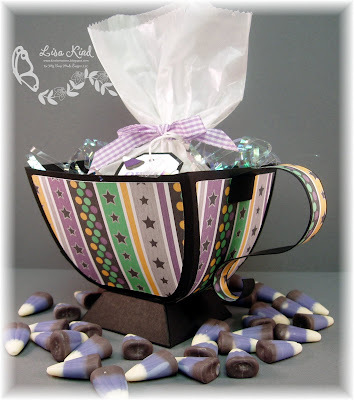 I used black for the base and the decorative pieces are from the new Traditional Halloween digital paper. I thought this sort of looked like a cauldron! I put the candy corn in a bag and tied it with a ribbon. I made a tag using SU's tag punches. I used the Spooky Surprise stamp set to stamp the sentiment. I have to tell you that I did something daring for me....this sentiment is one long sentiment and I cut it apart! It was like cutting off my finger! LOL!! I was so nervous about cutting it because I've never done that before! But I didn't feel like masking it every time I stamped it, so out came the scissors and snip, snip it went! Then I was able to stack the words so they fit on the tag. I stamped the candy corn twice and colored them like the real ones. I cut them out and placed them on the tag. Here's a closeup of the tag. 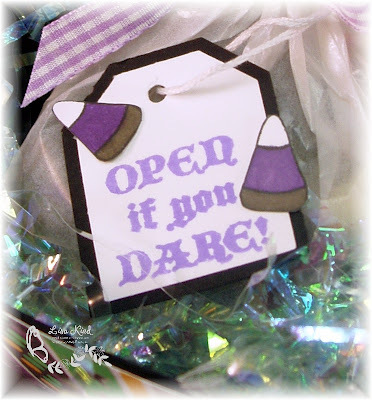 I really like the way this tag came out...with my new courage to cut apart my stamps! LOL!! You can now purchase these products at My Time Made Easy. The October release is available at the store. Think of all the possibilities for this template. The girls have been presenting it in a variety of ways. You can see all of them in the MTME Gallery! So much inspiration all in one place! 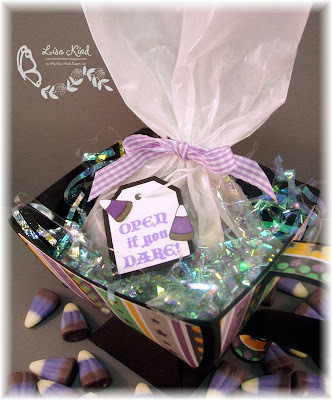 Don't forget to stop by Lauren's blog to see what she has posted. Also Pam, Catherine, Debbie, and special guest designer Ashley Cannon Newell are posting today as well. Swing by their blogs to see what they've done. Thanks for stopping by today! 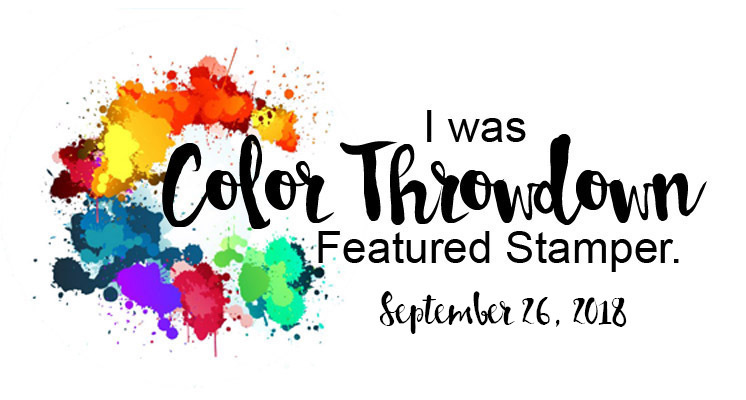 I'll be back tomorrow with a new release from Paper Makeup Stamps, so make sure you stop by!